The constant functions perished first. Everyone began planning a vigil, a sort of funerary service in honor of their memory. I don’t mean spit on anybody’s grave, but let’s be honest about who the constants were: simpletons. They stagnated in time. Never grew, never shrank, never changed. I pity them not so much for their grisly demise as for the bland, purposeless life that had come before. Call me an elitist and an unfeeling snob, but to me, a constant’s existence is no existence at all. Not that they deserved their fate. Nobody deserves that. I came for the vigil, of course. (I’m an exponential, not a monster.) I held my tongue and let the lower-order polynomials drain their tears on eulogies. They told anecdotes of the constants’ reliability, their steadfastness. They told self-aggrandizing stories of intersection and tangency, moments when the constants had told, say, a quadratic, something about itself: where it was, where it was going. Simpleton wisdom. Charming stuff, I guess, but not my cup of tea. Filing out of the vigil was when I first heard the word. It rode a wave of terrified whispers across the crowd, uttered like the name of a demon or a plague. Rumors painted it as a waterless flood, an invisible Armageddon. It sized you up like the Hand of God: how you’d grown, how you’d receded, where you’d been and where you were destined to go. It knew the curvature of your past and the untold shape of your future. It swept through in an instant, like the mad justice of a tsunami or the silent pulse of a neutron bomb, pain outpacing sound. It had slain the constants, smothered them like infants, and no one knew when if or when it would come again. Or who it would claim next. We should have known. We should have put it together: the constants’ slaughter, plus the slight changes in everyone else—quintics going quartic, quartics going cubic. We should have seen what was coming. But even if we had, what could we have done? The Differentiation came again in the night. I felt nothing. Slept right through it. It was only in the moments afterwards, as cries filled the streets, that I jolted awake. We spent those next dark minutes beneath flickering lamps, checking ourselves for wounds, too terrified to be alone. Everyone showed signs of damage. Take sine. In the first differentiation, it had transmuted into cosine. Now it had become a dreadful mirror image of its original self, a perverse reflection. Cosine had suffered the same fate: first transformed into a reflection of sine, and now back into an awful negative image of itself. Oh, they fretted and sobbed, sine and cosine did. They feared, above all else, that these changes might be permanent. In hindsight it sounds naïve, even laughable. Now we know: permanence was the wrong thing to fear. Then, as dawn broke, it became clear who had died: the linears. I’d known linears. I’d been tangent to some of them. I wouldn’t call them “friends,” mostly because I’m a stubborn jackass. But we’d been close, those linears and I, if only for a little while. Someone asked me how I was feeling. I thought they meant about the deaths—did I miss them? Was I grieving? I deflected by saying I felt numb; that it was too fresh to mourn yet. But what they really wanted to know was this: what damage had I suffered? What had the Differentiation done to me? And so I finally confronted the truth from which I’d been averting my gaze all night: the Differentiation hadn’t done a thing to me. Alone in the realm of functions, alone in this nightmare landscape of peculiar wounds and fresh deaths, I was completely untouched. Apocalyptic religion gripped many. Already, they had poured their fear and despair into the Differentiation’s open maw; now, too, they poured their worship, their prayer, their pathetic pleas for mercy. But the Differentiation has no ears: only talons and eyes. After the third slaughter, we dug new graves and buried the quadratics. Beautiful functions, creatures of genuine complexity, a diverse family of varied curvature—gone. Erased. Differentiated, and now deceased. We sat afterwards, smeared with dirt and panic, and set to work piecing together the grim puzzle of our collective fate. We wanted to know who was next. We despaired of finding a reason in the slaughter, but perhaps we could at least find a pattern. Why the constants? Why the linears? Why, now, the quadratics? And most crucially, who was next? How can you know? I shouted. What mark has the Differentiation left on you, what dark fingerprint, that you can anticipate its next move? Is the Differentiation a plague, a storm, a vengeful god come to smite the wayward and the weak? When the Fourth differentiation came, that cubic (and all the others) disappeared, leaving only the silent thunder of a prophesy fulfilled. The attacks came faster now. The pattern was all too clear. 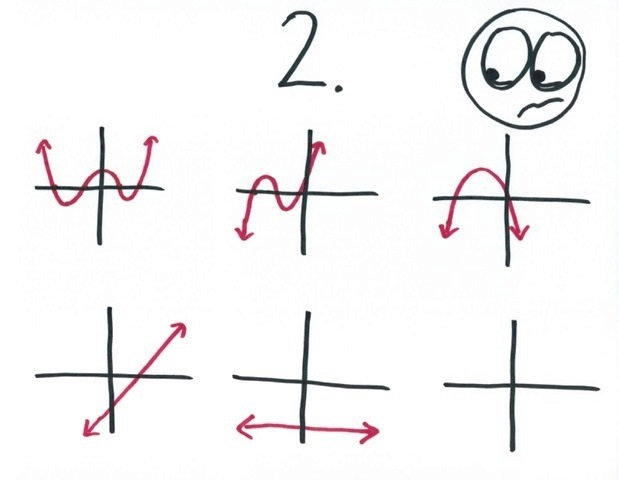 The polynomials bore the cruelest fate. They perished in droves, vanished in waves. The the quartics, the quintics, and so on—they each fell in turn. With each attack, the Differentiation brought the polynomials down by a single degree. It might not seem like much. The truly high-order polynomials—with degrees of a thousand, ten thousand, even a million—they still felt safe, still refused to believe they’d suffer their cousins’ fate. But the rest of us knew. One degree at a time, they would dwindle away, until they became constants, and then… nothing. Other functions would live. But they’d live mangled, twisted, deformed—and in perpetual flux. 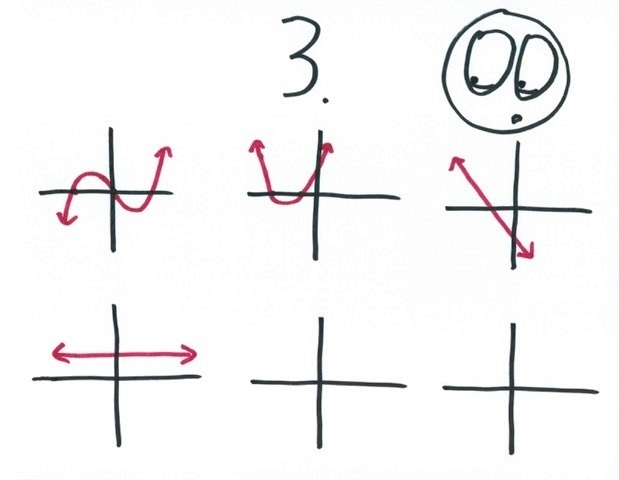 For example, the fourth Differentiation had restored sine and cosine to their original selves. But the fifth transformed them once again. They found themselves caught in a horrible cycle, blinking from one form to the next, like shadows thrown by a strobing light. I stood alone, unscathed, unchanged, unknowing. For a long time, I simply watched the world around me dissolve. I wondered, day and night: why had the Differentiation singled me out? 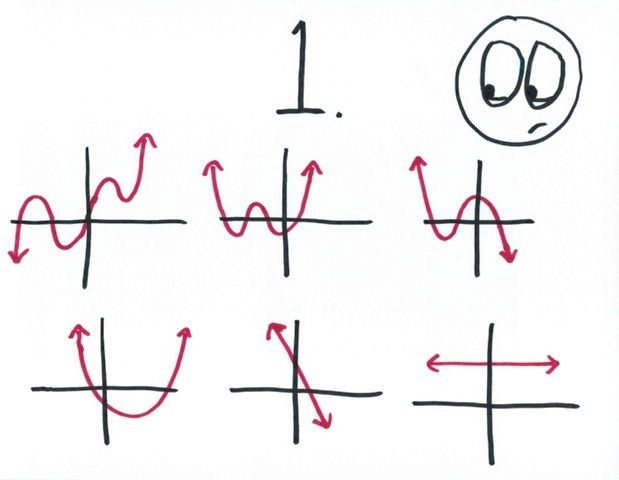 I had always believed (without emotion or ego) that I was superior to the polynomials. Even the largest-degree, the most ambitious, the highest-flying—I knew that I outgrew them all. Perhaps it was this greatness that saved me. The Differentiation, I wanted to believe, was not truly cruel. It simply had standards. Ones that I alone met. And so the world around me transformed, and I remained the same. I thought back to the constants: the simpletons, the sweet imbeciles, the first to perish in that initial Differentiation. Those sorry functions, stagnant in time. Never growing, never shrinking, never changing. And then, in a flash, I understood. The Differentiation had not spared me. It had damned me to a special hell, a fate far crueler than the inexorable death of the polynomials or the unending fluctuation of the trigonometric functions. By leaving me unchanged, the Differentiation had answered my pride and my hubris with an act of savage and ultimate justice. The Differentiation had made a constant of me. And so my vile existence continues, like a steady and uninterrupted stream of drool. The polynomials perish. The trig functions flicker. And I—the mighty exponential, once their king and superior—I stand here, spared their minor sufferings. I never grow, never shrink, never change. I am damned instead by the most terrible judgment of all: In the fiery eyes of the Differentiation, I am nothing but a constant. Bro what even is this tho? *wipes tear* That was beautiful. First it came for the Constants, and I did not speak out, because I was not a Constant..
Well, I never liked constants anyway. . .
Once again, you have outdone yourself. I stand in silent awe. Damn. 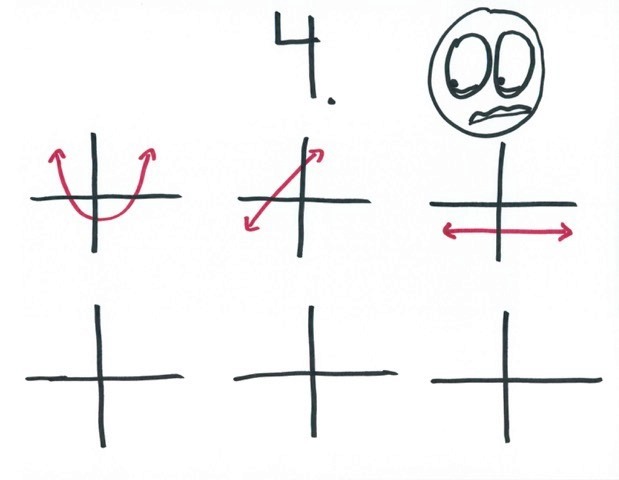 I’m getting choked up about polynomials right now. How good a writer do you have to be to make people grieve for the fate of differtiated polynomials? This should be a movie. 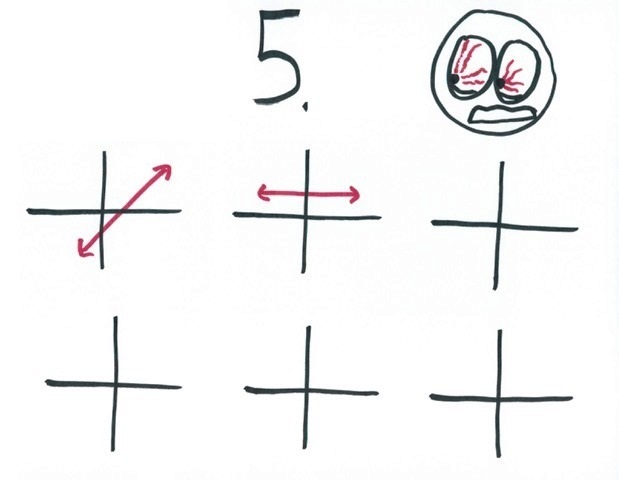 Jennifer Lawrence could play e^x and Robert Redford could play cosine. “The Differentiation had made a constant of me.” The point of Archimedes that turns Differential Equations around. Then came along the continuous Brown function which, being nowhere differentiable, slew the Differentiation. Hooray! I’ve never reblogged a post before, but this is simply amazing and is worthy of being the first. I also partially reblogged this because I want to let you know that I’m still alive, and I sincerely apologize for my lack of posts. I promise to get to writing soon, and will have an original post out at the latest around Thanksgiving. You have to make a video of this. Know any animators? If I have to spend the next year until Halloween 2016 figuring out how to do it, I will, but it’d be a lot more efficient to get someone who already knows what they’re doing. A radio play would work as well. Maybe more of a game. my head is reeling brilliant sir. I’m no damn good at numbers but you left me dumbfounded, please teach me how to become an exponential like you ….the world around me is changing but here I am still counting stars and marvel at their brilliance at night. Yes, money makes the world go round and I can’t help it because I’m just a mere weed in your garden to be thrown and burn useless, nothing …..you’ve done all efforts to make things grow ,still nothing happens. . Dear sir, you fail to calculate that we constants needs your kind to guide and teach us until such opportune time for us to grow. I marvel at your greatness , in our lowly categorized state of being nothing please see that the world needs you , desperately to constantly grow. .. to help the lowly and needy, to comfort us and see the beauty around us. We need each other to complete to sum as whole. I know, I’m foolish to dream so big as this but isn’t dreams are free ? Isn’t life borrowed one thing that is changing in stages like a river? I know that I’m foolish and I’m sorry. I’ve lived life with understanding that God’s hand governs everything our fates and our future our lives is in his hands. Letting me see all my wasted efforts and I was hurt . I finally, realize that we can be what we wanna be ….it’s our choice . I’ve made a terrible irreversible mistake then. no actually, always that makes my life a living hell. I can’t turn back time nor have the power on my own to make my life worthwhile. You were there to help us grow but we refuse to grow…. I know am a fool . Professional mathematician here. Can I just say this is incredible? Gave me chills. 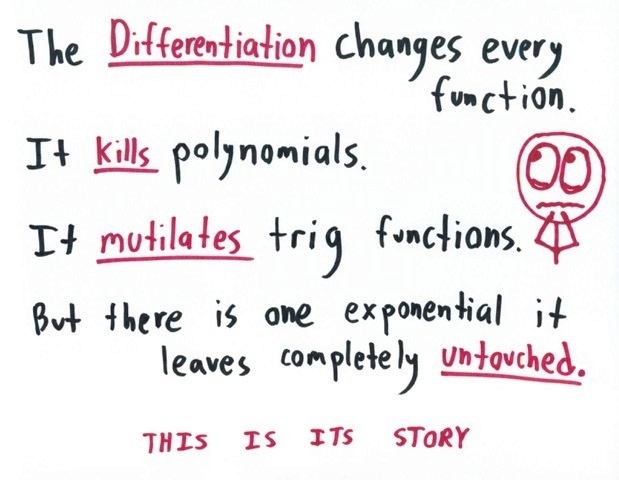 Do not fear the differentiation, polynomials. I am gathering up my chosen functions. The meek and lowly of degree shall be the first to come unto me, who is y=0. This was an absolutely brilliant read! Loved it!